GRAPELAND – On Thursday, July 5, the Grapeland Noon Lions Club experienced a first. For the first time in the club’s lengthy history, the meeting was gaveled to order by a female president. After being installed as president last month, Lion Martha Childress opened the meeting and welcomed all of those in attendance. “Didn’t we have a wonderful end-of-year fish fry? We had 76 people there and that is the most we have ever had there to my knowledge. Let’s keep up the good work. We had 45 Lions and 31 guests,” she added. After prayers for those in their time of need and the invocation, applications for membership in the Grapeland Noon Lions Club for Janet McDaniel and Sarah Lee were approved. 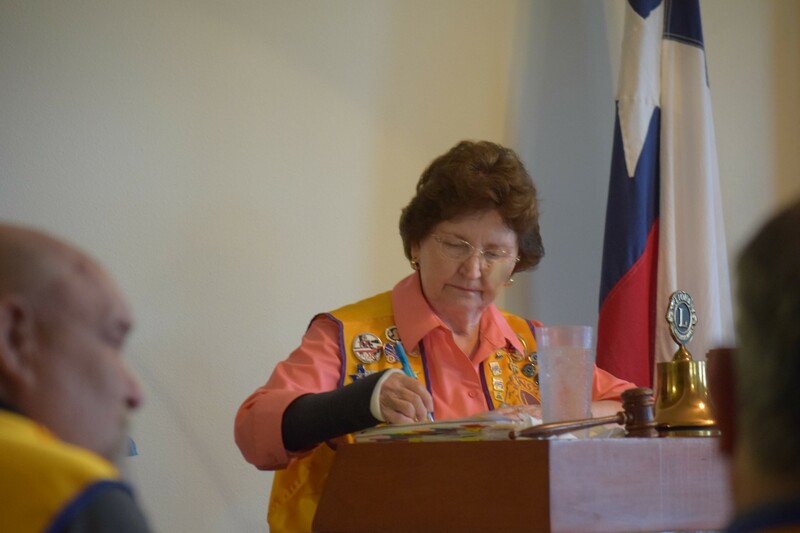 Once the memberships were approved Secretary Laura Walling read the minutes from previous meetings and outgoing Treasurer Allen Cheatham provided the club with an up of the club’s financial status. Cheatham also distributed a breakdown of the recently held Lions’ golf tournament and said while the figures had not been finalized, the sponsorships and donations appear to be the most ever received for the annual event. Following the golf tournament update, Joe Tumalad, the nurse practitioner at Grapeland Urgent Care and his wife, Sandra, gave a presentation on how to use and operate an AED (automated external defibrillator) device. Tumalad walked the club members through the process of using an AED and said the first thing to do is call for help and then turn on the AED and follow the visual and/or audio prompts. Next, Tumalad said to remove all the person’s upper body clothing. The AED pads should be placed on the upper region of the right hand side of the chest and the lower left hand side of the chest. Make sure no one is touching the person and then push the analyze button (if necessary) and allow the AED to analyze the person’s heart rhythm. If the AED recommends that you deliver a shock to the person, make sure that no one, including you, is touching the person – and tell everyone to stand clear. Once clear, press the shock button, he explained. AS the meeting continued, Childress said one of the upcoming events would be the “Charter Night” of the Grapeland Leos club. “We have anew Leo Club. As you know, the Leo Clubs are for 12 to 18-year-old students. As you remember June Springfield has agreed to be our adviser. We have a committee in place and they have met several times now. They have elected their officers and I’m proud to announce that on July 2, we got the official word from LCI (Lions Club International), that the club has been chartered,” Childress informed the members. She added the next step for the club was to have a charter night for the Leos. 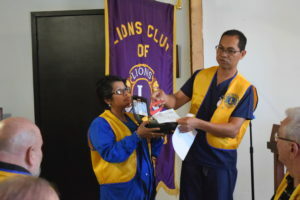 “All the Lions Clubs in the district will be invited and all the Leo Clubs will be invited,” she said before indicating many of the clubs would be unable to attend. Next articleEverybody Loves a Parade!